Some Philadelphia neighborhoods outdid themselves in Tuesday's presidential election. In a city where President Obama received more than 85 percent of the votes, in some places he received almost every one. In 13 Philadelphia wards, Obama received 99 percent of the vote or more. Is Pennsylvania no longer a swing state? Payback for Philadelphia's big turnout for Obama? Those wards, many with large African American populations, also swung heavily for Obama over John McCain in 2008. But the difficult economy seemed destined to dampen that enthusiasm four years later. Not to worry. Ward leaders and voters said they were just as motivated this time. "In this election, you had to point out to the people what was at stake. And in many cases, they felt that the Romney doctrine was not going to favor the working man," said Edgar "Sonny" Campbell. Campbell is leader of West Philadelphia's Fourth Ward, where Obama received 9,955 votes. Romney? Just 55. That's five fewer than McCain in 2008. Campbell acknowledged that the odds are stacked in his favor in Philadelphia, where Democrats outnumber GOP voters by nearly 7-1. "You are looking at black neighborhoods where you have 1,000 voters in a division and maybe seven Republicans," he said. "We are shocked if Romney got any votes." Even so, Randall Miller, a history professor at St. Joseph's University, said politicians almost never get 99 percent of the votes anywhere except, perhaps, the towns where they were born. He said the Democratic voter turnout effort deserved credit for the president's success. "Ninety-nine percent is extraordinary, and it shows discipline as much as anything else," he said. Philadelphia's numbers were tilted so far in favor of Obama that one incredulous Republican revived the specter of voter fraud. House Speaker Sam Smith, musing over "staggering" turnout in some city precincts and reacting to wrong information that "90 percent of the precincts in Philadelphia County turned out over 90 percent of voters," called the ability to get such numbers "questionable." Smith's math does not add up. Voter turnout in Philadelphia was around 60 percent, according to state election figures. State Sen. Vincent Hughes (D. Phila.) responded swiftly. He said Philadelphians came out to vote because they were tired of the "hard-right" Republican agenda. "If they believe there was a corruption of the process, then go to court and challenge it. Show the people of Pennsylvania," Hughes said. "Beyond that, shut up." Nor was Philadelphia the only place in the region with such high numbers for Obama. Five Delaware County towns topped 90 percent, led by Yeadon at 96.3. Following were Chester City (94.8), Darby Borough (93.5), Chester Township (92.3), and Colwyn (90.3). On Wednesday, Mayor Nutter, who doubles as leader of the city's 52d Ward, said voters of all races were offended by attacks on Obama and acted to defend the president. "I think ultimately a lot of folks . . . wanted to express themselves in a very direct fashion and came out in droves yesterday to support someone who actually deserved to be reelected," Nutter said. Nearly 96 percent of voters in his ward pushed the button for Obama. In Campbell's ward and in the nearby 44th, people said that they believed Obama had done a good job and that they had little confidence in Romney. Tim Bee, 51, of the 44th Ward, voted for Obama and would have not been happy with a loss. Sitting next to Bee, James Tharrington, a 46-year-old Community College of Philadelphia student from the Fourth Ward, praised the president for recognizing that the country is a "melting pot." Standing a few feet away was Janean McGee, a 22-year-old supermarket supervisor, wearing an Obama/Biden pin. McGee, who voted for Obama in 2008 and Tuesday, said she opposed Romney because of his stance on abortion and other women's issues. "There's more than a 'binder full of women' out there," she said, referring to Romney's remark during the second presidential debate about his efforts as governor of Massachusetts to hire women. The presidential race was not even the subject of much discussion in her West Philadelphia neighborhood because "everyone said straight Obama." When McGee mentioned Romney's name, a passerby jeered, tossing profanities in her direction. 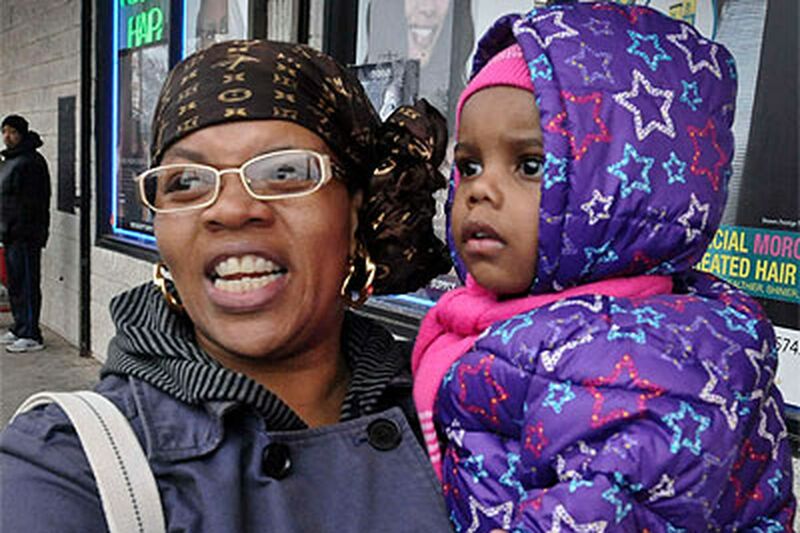 Shakiena Williams, a 35-year-old mother of two, said it was unfair to blame Obama for the country's problems. "It's all been a mess from before he was elected," Williams said of Obama, for whom she voted in 2008 and again in 2012. "I like what he talked about . . . the middle class, the economy, and schools." Holding her 2-year-old daughter, Jahira, by the hand, Williams said she thought the community was less enthusiastic this time around. "Everyone was so dependent on [Obama] for hope and change, it doesn't happen just like that," she said. Barbara Martinez said she, too, went to the polls Tuesday because she believed Obama deserved a second term. "I think he needs more time to get the job done," Martinez said. An 84-year-old who has voted for the Democratic candidate in every election, Martinez called Romney "more of a businessman than a politician." Matt Wolfe said that as the Republican ward leader in the 27th Ward, also in West Philadelphia, he does his best to turn out GOP voters and rarely tries to convert the diehard Democrats who live near him. "We tried to get all our Republican voters out to the polls," said Wolfe. In his ward, 13.5 percent of voters cast ballots for Romney. He said he could not even count on his own committeemen to vote for the Republican. Committeeman are elected party officials who report to the ward leaders. "I had one division with two [GOP] committeemen in it and only one vote for Romney," he said. He declined to identify the committeemen. Contact Miriam Hill at 215-854-5520, hillmb@phillynews.com or @miriamhill on Twitter. Inquirer staff writer Angela Couloumbis contributed to this article.